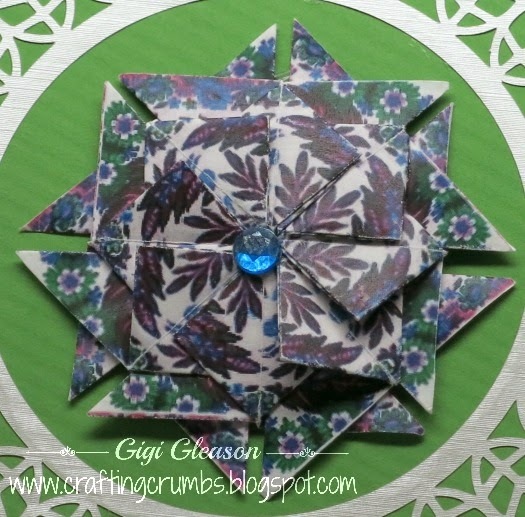 Teabag Folding Card - Learning Again! It was time to go back to my roots again - well where I started making cards once I branched out from straight computer cards. I chuckle when I think about it now. Remember when printing cards on the computer with all of those programs were all the rage and we were so proud of ourselves for "making cards"??? Don't get me wrong - those programs were great and I still use them on occasion for printing the inside of my cards. But the transitions were interesting. 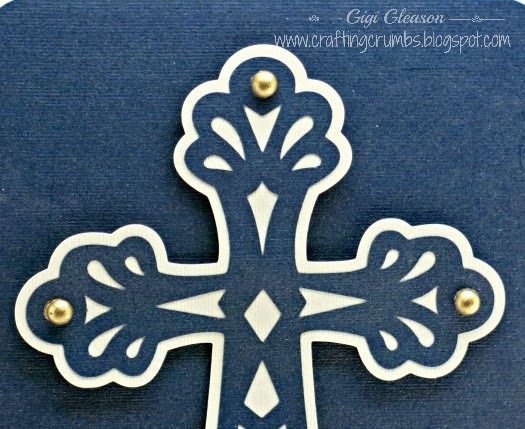 I belonged to a cardmaking group in the mid 90s - and we shared things we were doing. It started with using glitter glue on the cards and making bookmarks that were attached to the card with perforated scoring so it could be detached - so many fun things. 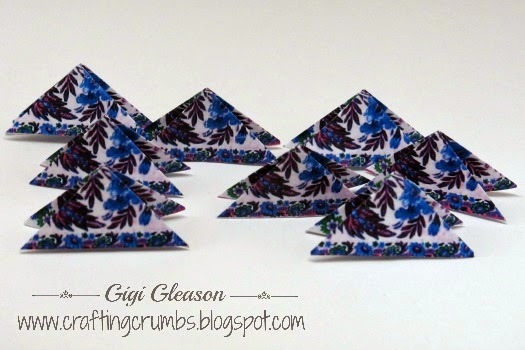 But when I tired of that, I turned to the Dutch papercrafting that still intrigues me. I loved learning different things and I still love returning to these very hands on crafts from years ago. "re-teach" myself when I decided to try it again. I am not sure what got me thinking about it, but when I explored the internet I was amazed at how much was still out there. There is even a website that will take any image and turn it into a page of teabag tiles whatever size you want.. So there is no limit to what can be created. For those who are not familiar with teabag folding, it is done by basically taking a square shape, folding it into a different configuration and then repeating that with other squares and interlocking them into a final shape, usually called a medallion. 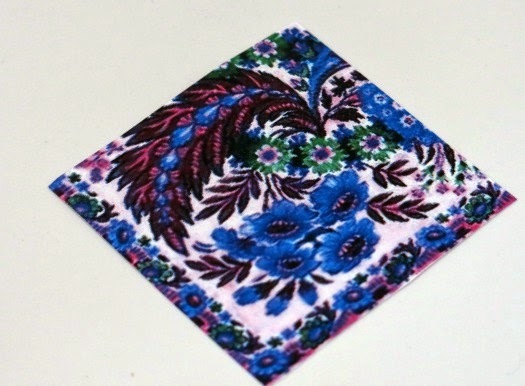 One of the 2 1/2" squares printed from the internet. Is that as confusing as it sounded?? If all of the squares have the same pattern then the design has a very defined look, like the image I used in the card below. But you can also use gift wrap, newspaper, random patterns and create an entirely different effect. I plan to do more folding in the future and share some of the interesting options with you. For this card, most of the papers used were from Paper Temptress. The white backing and lacey leaf frame are from the luster canvas line - I love how textural it looks. The frame is from Monica's lacey frames. 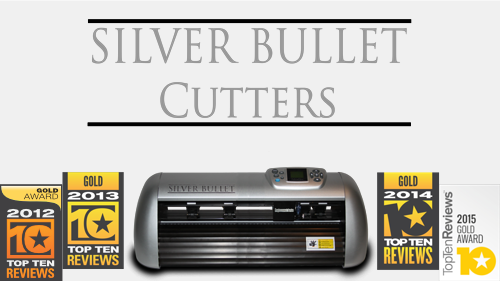 Most of her patterns are very detailed and they cut beautifully on the Silver Bullet Professional. The teabag was printed from a jpg file I found and converted into a sheet of 12 tiles or squares. I only used 8 for this medallion. with the same pattern visible..
some of the detail in the medallion. If I flipped it over, it would have a different appearance. It is really quite easy and fun to do. 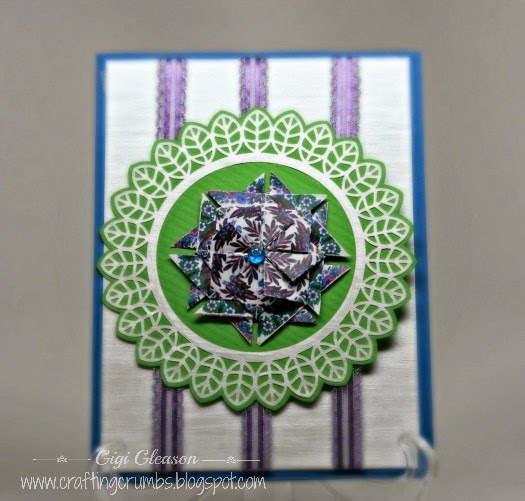 I used a blue Spectrum Noir marker to color a clear crystal to complement the color of the card base and then put some Wink of Stella clear glitter over it for a bit of sparkle. The purple striped iridescent ribbon is also from Paper Temptress. I learned a lot while playing with this technique again and am eager to practice and share more. This was made for a very special friend who has had quite a difficult month. I am hoping it will make her smile and bring a little cheer into her day. She brings sunshine into all the lives of those she touches. The final product. I hope it travels well! Am back with one more sympathy card. The next one is utilizing a file I really like (cannot remember where I got it )! I have used it before with an acrylic and glitter background and it cuts like a dream. There is something so serene about a gentle hummingbird flitting gracefully from flower to flower. 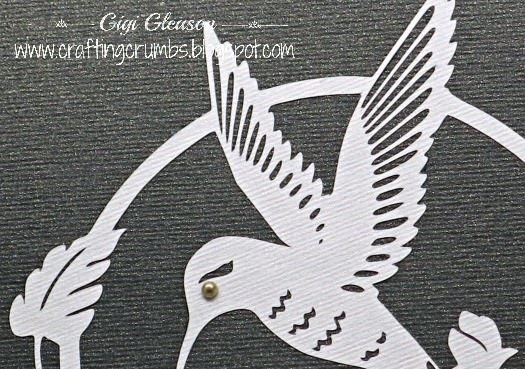 I am highlighting a closeup of the hummingbird feathers because of the detailed cut I was able to get with the Silver Bullet Professional. You can see how minute those feathers are and the machine just sped through those. I always worry when I have it cutting so fast that it may not be able to handle the details if there are a lot and/or they are tiny, but it never disappoints. The cardstock is from the incandescent line (candido and nero) from Paper Temptress - they both have what looks like thin gold threads woven through the paper. 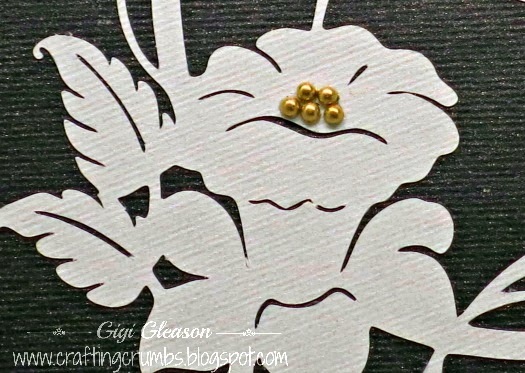 It is so elegant and why I chose the gold pearl accents for the hummingbird eye and the flower. I used a gold leaf pen to get that rich gold color. I think this is one of my favorite cards. The ideas have been seeping into my head and I am trying to do a better job of writing them down as bits of creativity slip in and rapidly out of my brain. The first card is a very nice cross from dear friend, Penny. (Penny Duncan Creations). It is her Fancy Christian Cross. I love her files and can always count on them to cut beautifully. This paper is from Paper Temptress and is the incandescent paper - blumarino and candido. 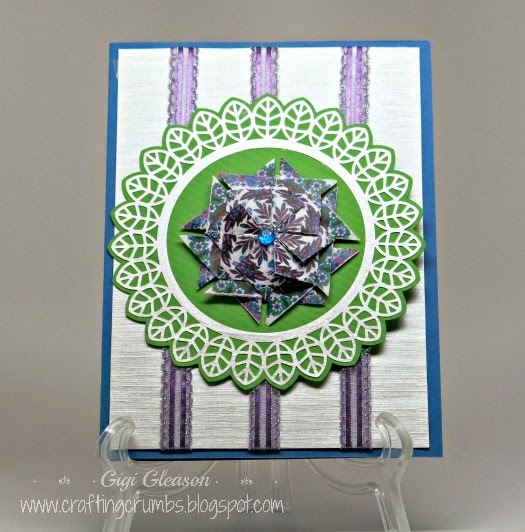 They are elegant and make any card look more special! 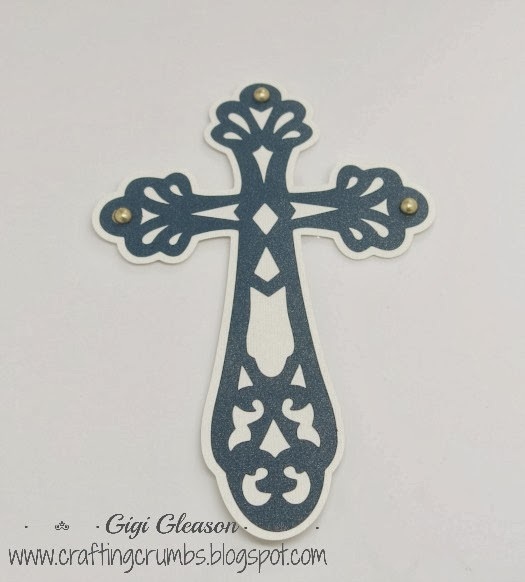 Love the simplicity yet beauty of this cross. You can see the richness of the colors in the closeup. And the next one I am choosing to share also utilizes a file from Penny. I got the idea from something I saw on Pinterest and I used Penny's file as the foundation to make a medallion. 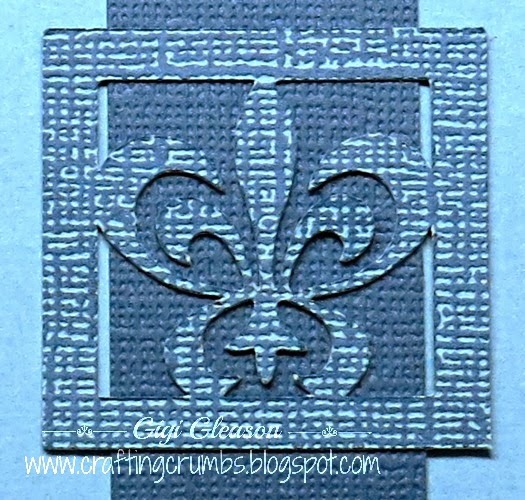 This is a fleur de lis from Penny's embellishments - Deco Items. I wanted it to look like ribbon was running along the side of the card and was anchored by these embellishments, so I took Penny's design and and a frame design in the shape library of SCAL, and welded them together - success. It was very easy to do and I love the way it looks. Again, thanks to Penny for inspiring these two cards. It really jump started my ideas. Will be sharing one more in a few days. I realize the title of this post makes no sense. There is absolutely nothing surprising about the fact that bananas and chocolate are good together. It's like peanut butter and jelly, cinnamon and sugar, cheese and crackers....... it's a perfect pairing. But the surprise to me, was what a difference a little change in a recipe can make. I had very ripe bananas that were literally screaming to be used. 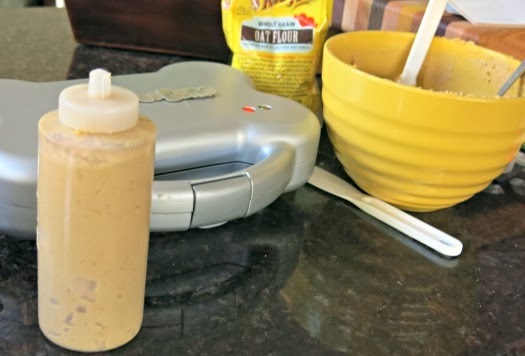 I wanted to try something different and found a relatively simple recipe on Real Life Dinner . But I decided to tweak it a little. 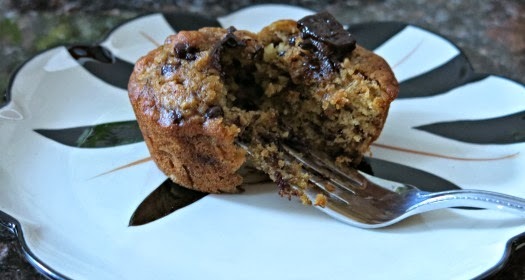 I am a huge fan of the burgundy chocolate chunks from King Arthur, but decided just to put one on top of each muffin and stay with the mini chocolate chips in the batter so the chocolate would not be overwhelming. 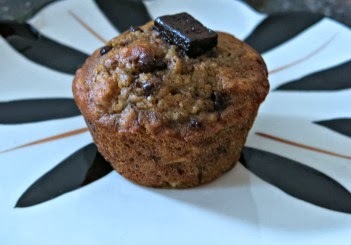 But what I did want to add was the flavor of brown sugar to the muffin, but not just any brown sugar. I am a huge fan of muscovado sugar so I used a 3:1 ratio with that and the granulated sugar keeping the total sugar required the same. The flavor ended up so rich and moist - and I am eager to incorporate it into more recipes when I want that added "wow"! Mash the bananas well and then add the vanilla, sugars, and egg and mix until well combined. Add the slightly cooled melted butter. In a separate bowl, combine the dry ingredients and whisk until blended. Add the wet ingredients into the dry ingredients and mix gently just until the dry ingredients are moist and mixed. Fold in the mini chocolate chips. 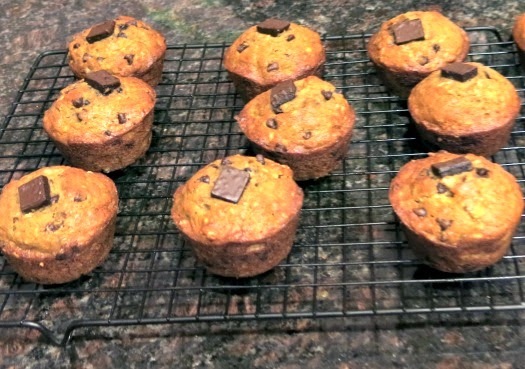 Spoon the batter into a prepared (lightly greased or paper lined) muffin pan. Place one burgundy chunk in the center of each muffin and bake for 15-20 minutes or until a toothpick inserted in the center comes out clean. Cool on a wire rack for 10 minutes and then remove from pan and finish cooling,. Waiting for them to cool completely is the hard part! This is definitely a comfort food. It is great in the morning with a cup of coffee, as a snack in the middle of the day, or even a late night treat. And they stay moist for days. I have clearly found a new favorite way to use my neglected bananas! If you have not tried muscovado sugar, it is worth the search. It adds such a depth to baked goods. I think I have become a dark brown sugar snob! The second card this week was a bit of a surprise, an embarrassing one for me to admit. I have long been a fan of Technique Junkies and have all of the yearly cds along with the specialty ones that Pat Huntoon has produced. But have I used any of them?? Nope... I go through the paper copy of the newsletter when it comes, but I rarely go back when I need ideas. So on a fluke I put in her latest cd called Designer Paper Perfection and wow.....so many great ideas for making fun backgrounds with a variety of mediums. I was in awe of the creativity and then.. there it was..... the idea for my next card. 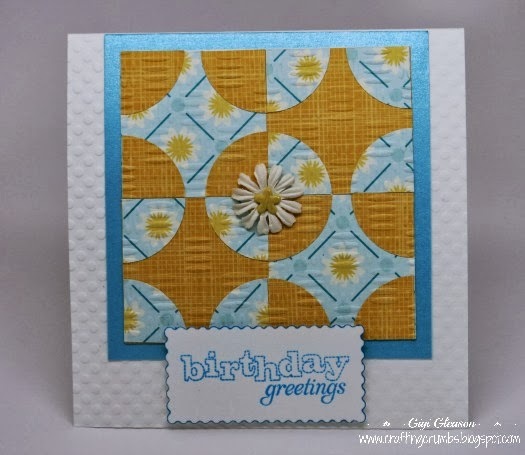 It is a quilting background and the birthday card I need to make is for a dear friend who loves to make quilts. It was the perfect answer. So.....for this one I used two complementary designs from Echo Park papers. 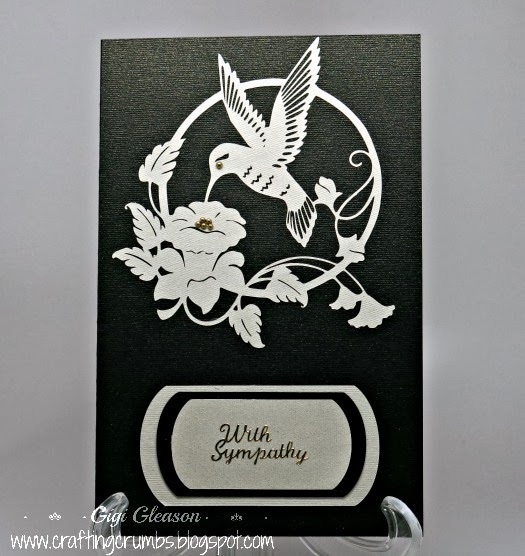 The card base is linen from Paper Temptress that I embossed with Petite Dots from Embossalicious. The quilt pieces were also embossed to make them look more like material with the Gun Metal folder, also from Embossalicious. 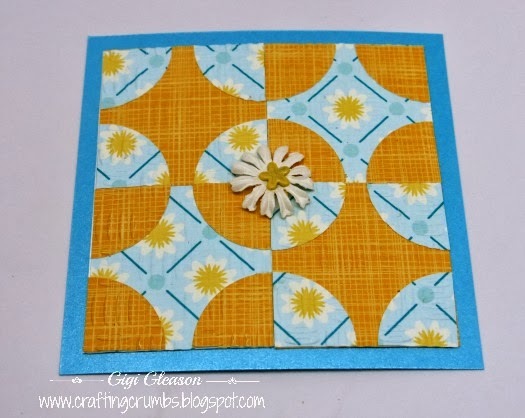 The quilt pattern is achieved by using a combination of circles and squares - so simple really,but it has made me want to look for more quilting patterns and see how many I can adapt to cards because this was really fun - and relatively easy too! 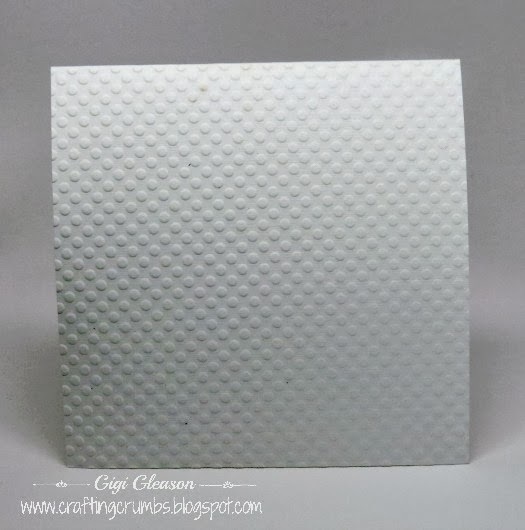 I love the added dimension of the embossing folders. 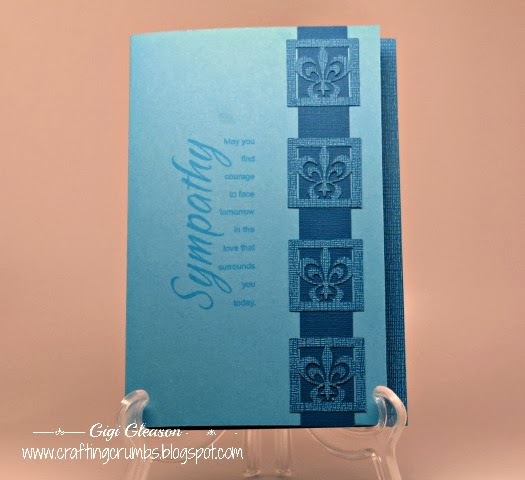 Look at the shimmer of the lunar blue card stock from Paper Temptress. It is so pretty. 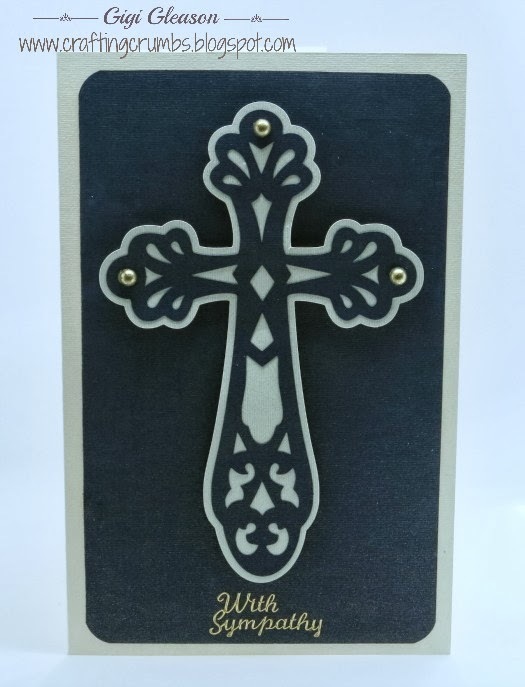 Embossing the card base is something I rarely do, but I love the added texture. So happy with the finished product - a fun quilt, no sewing required. I know I will be making more of these! So it's Sunday night in southern California and the stars are out - literally - as it's Academy Award night...that special time of year when celebrities don their best and show up in force to vie for that golden statue! You may think that every good Southern CA born and bred girl celebrates Oscar night with a party, fun foods, fancy clothes -but not this girl! If the truth be known - there was a time when I did just that! We had a local non profit organization that had an Oscar night fundraiser and everyone dressed up, entered on a red carpet, and helped raise money for a domestic violence shelter and program. It was great fun and very festive. But that was then and this is now. I am in my pjs and slipper socks and baking in the kitchen. So are you imagining delectable delights being prepared to munch on while I drool over the jewels and gowns parading across the TV screen??? Well, you are wrong. I am baking dog treats. 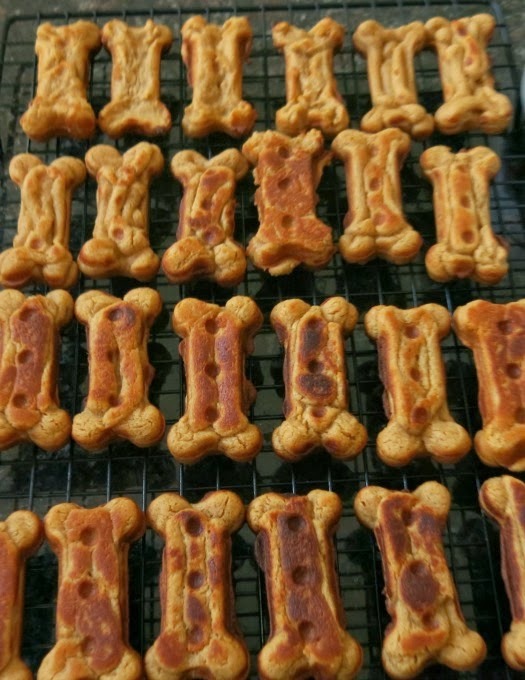 Yes, you read that right - homemade treats for my dogs. Just one more glamorous evening in sunny (yes the sun did come out today) southern California! I knew nothing about this clever contraption until a friend of mine visited me a couple of weeks ago and brought me a surprise. Little did I know the gift was really for Roxy and Honey, my faithful companions. And if they had known the true value of what was in the box, they would not have let it sit on the kitchen table for even a day without whining at me until I put it to work!! I am the first to admit that I am a sucker for kitchen gadgets. I love them. But I doubt I would ever have bought this for myself. It just didn't seem practical. But getting it as a gift shed a totally different light on it and made it fun to play with and experiment. And that I did! So...let me introduce you to...... BAKE A BONE!!! 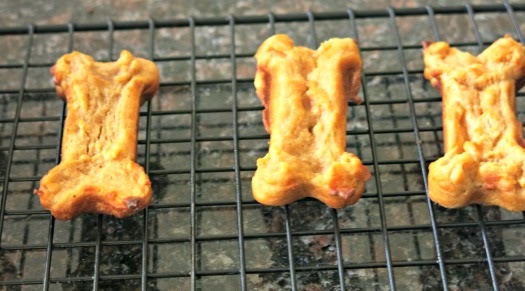 Yes - it does exactly what it says it does - it bakes bone shaped dog treats for the canine in your life!! The only con I can find is that it only bakes 4 at a time. But the positives so outweigh that small negative. The treats cook in 5-10 minutes. They easily slip out of the best non stick surface I have ever seen. They smell delicious. It comes with 30, yes THIRTY assorted recipes and you can tailor them to your pets needs/allergies. Once done they cool for 30 minutes and have a biscuit like soft interior. You can make them crunchy by putting them in a a preheated oven, turning off the heat, and leaving them in there for 4-6 hours. We all know how much dogs love peanut butter, so that was what I decided to make first. Just 4 ingredients - flour, milk, peanut butter, and baking powder. Does it get any easier than that?? And because I have one dog with a lot of food sensitivities, I used all oat flour and coconut milk. I love being able to choose what ingredients are in their treats. You do have to follow the directions and overfill the mold. My first few batches were not as high so did not have the details that future batches did. Just a little learning curve!! I attempted to fill the molds with a spoon or spatula as suggested, but found that difficult. So I made the batter a little thinner (about the consistency of thick pancake batter) and used a plastic dispenser to squeeze the batter into the molds. This was a Wilton candy/frosting dispenser - just cut off the tip to make it larger for the batter! and puff up once baked! Success!! This recipe made about 34 treats and they were large - 3 inches each! I had their FULL attention! 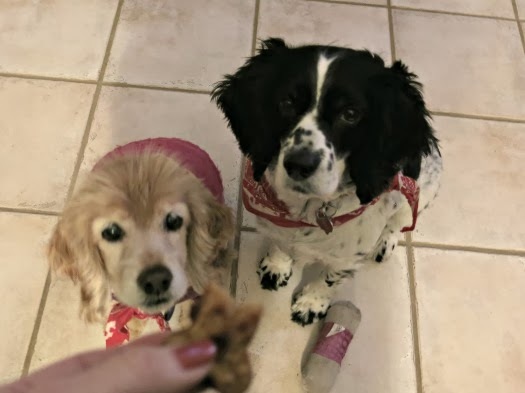 Honey and Roxy were eager to taste test the soft treats and they loved them. 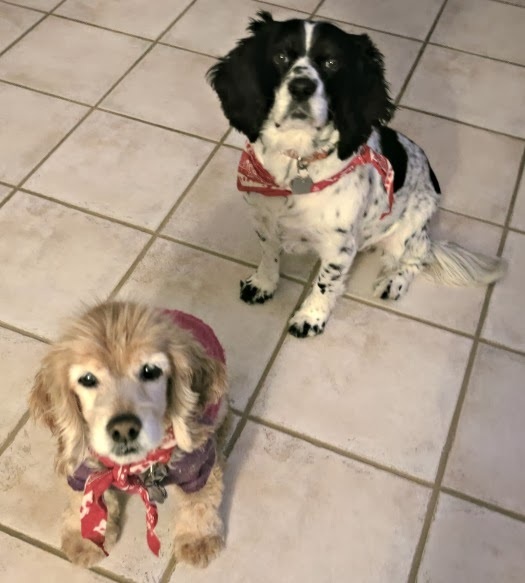 They must have been good as not a crumb of evidence remained! The anticipation was almost better than the actual treat! Love how eager they were to get those bites. If you are interested, you can find it at the link above or on Amazon. The company also makes four different treat mixes for the machine, but honestly, it is so simple to make and provide your own fresh ingredients, that I don't find them necessary. Hope you had a wonderful Academy Award evening too!